This “Chrome Plated” Floor Stand for Storage of Roll Material Up to 30 Inches is made of heavy gauge wire and constructed to hold (72) seventy two rolls of (3) three inch core diameter material, up to (2000) two thousand pounds total. Proper storage of materials dictate supporting rolls by the core to avoid damaging the special coatings on the roll face. This unit is very easy to assemble in less than five minutes. It comes in only (6) six parts and you only need a flat head screw driver. The unit has (9) nine ball caster rollers to allow easy movement with the stand fully loaded. 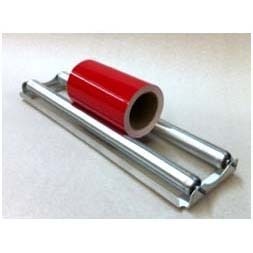 20″ Roller Tray Accommodates up to 150 LBS to Easily Roll & Re-Roll Material. 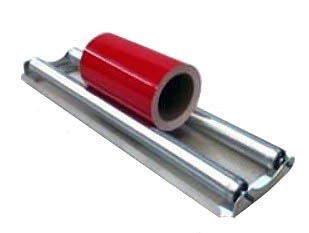 It Can Also be Used As An Application Tape Applicator Tool. Heavy gauge wire portable, attachable handle that allows easy pulling and relocation of the FR-1623 material floor rack.